I didn’t play the classic Warcraft game at that time. Neither did you I guess. But we all went to the theater for the first Warcraft movie and all of us enjoyed it. Let’s take a look on how it has all began. This article is a “how to” guide and I think I made it universal. We’ll look how to run the games developed for DOS on modern Windows and macOS computers. Actually it can be any other OS which can only get DOSBox (that’s our main tool), and this DOSBox thing can be installed on any fridge. But pictures in this article are for the latest versions of Windows and macOS. By the way DOS games can be played straight in the browser. I am not gonna talk about it in this article. 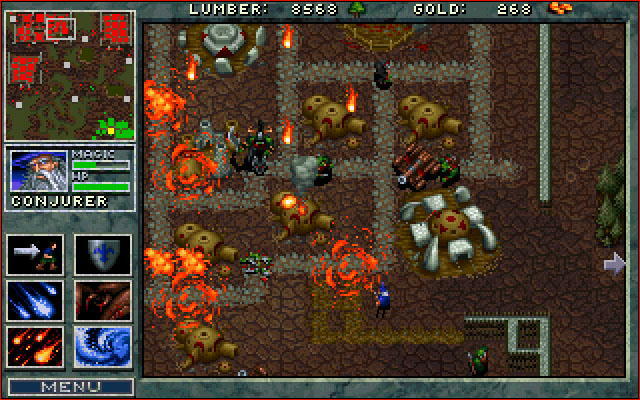 Just google something like DOS Warcraft online, click one button and play if you are interested in this way. But I don’t understand how they deal with save files and if it’s possible to save game at all. In the early 90s there was a Silicon & Synapse company that developed games for Sega. They have created The Lost Vikings and Rock ‘N Roll Racing. And then *boom! 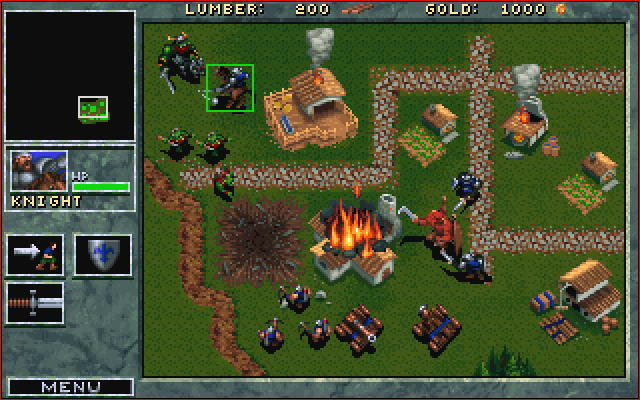 * they were renamed to Blizzard and immediately released Warcraft strategy game. People said that the game was a breakthrough, a bestseller. I don’t think that it was the first strategy game or something. Then, in ’94, it was already Dune II at least. But I have no idea. Not sure if I was even able to walk that time. Hit the like button if you too. The gameplay is very simple. I figured it out in just a minute. Units don’t have much actions. They can be sent to mine gold, chop wood, attack an enemy or build something. So we build farms, barracks and train an army for a battle! The story is told by CG intro video and pieces of text before every mission. Graphics and sound is pretty simple. 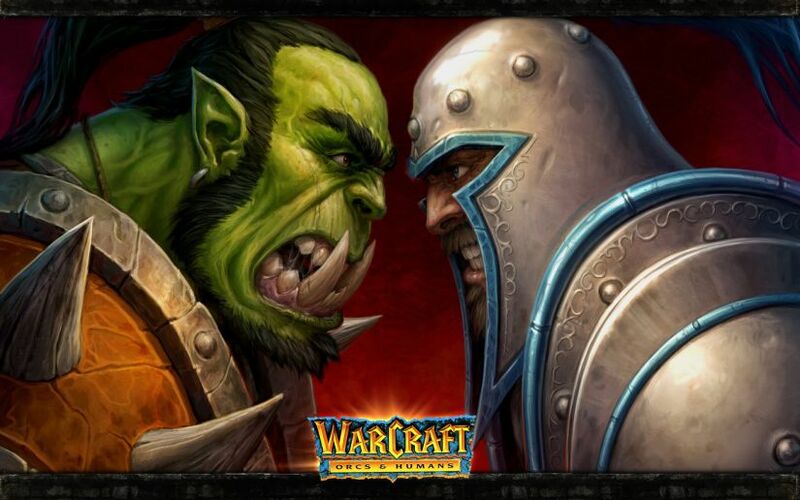 It is not so interesting to play this game now, it is more interesting to take a look what was a great first Warcraft. 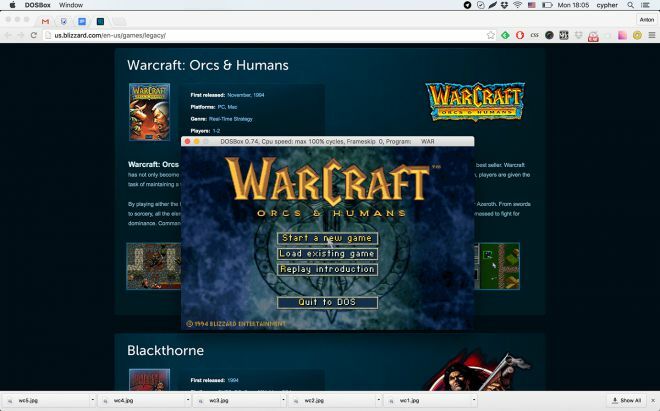 Warcraft is originally a computer game, and playing it on a computer is the most sensible choice. The pointer, a mouse, a keyboard and a large screen is what you need. The game, however, has very low resolution and we will have to play either in a small window, or stretch the image to fit the modern screen. But there is a problem. 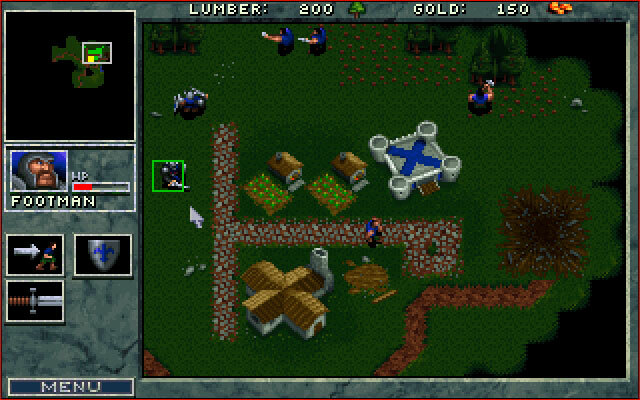 The game was developed for DOS. This is something that was before Windows and we can’t just instal itl and start playing on any Windows we can find now. Although some people say that there are versions that works on Windows XP. 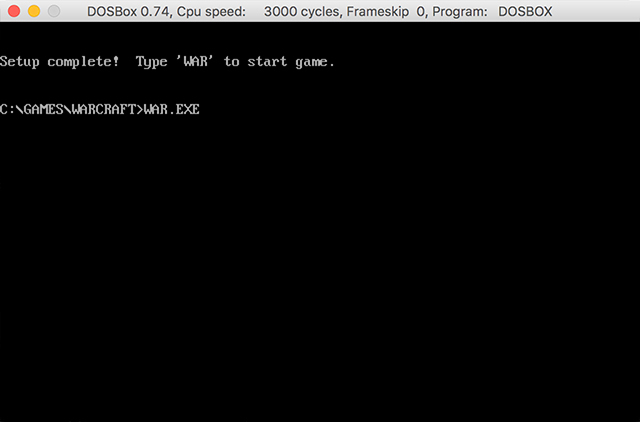 In addition to DOS the game was released on Macintosh, but you can hardly find an old mac. One way or another, either on Windows 10 or the El Capitan original game is not gonna work. But we will run it! We will use an emulator. This will work like that. Turn on the computer. Our operating system (Windows or macOS or any other) loads. 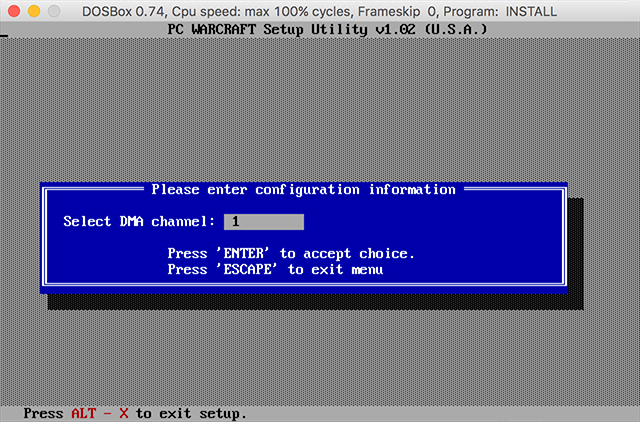 Run the DOS emulation software. It runs DOS we need so bad. 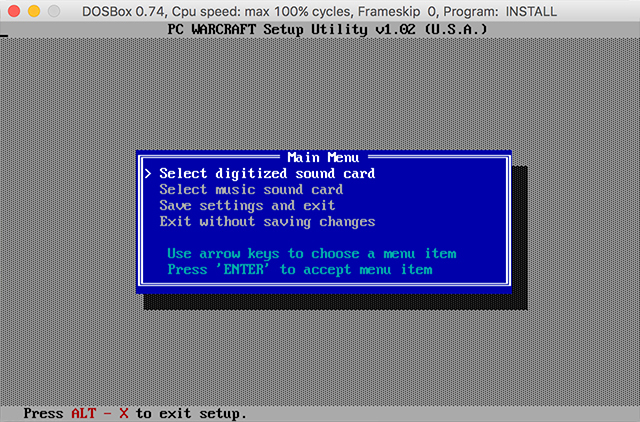 Inside of DOS we look for Warcraft, run it and play. 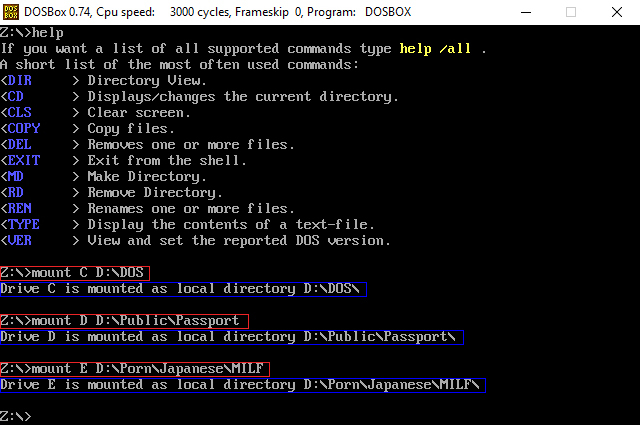 This is DOS emulator. It also includes operation system itself. For us this is just a normal application that we download from the Internet and install the most usual way. That’s all. We have a DOS! 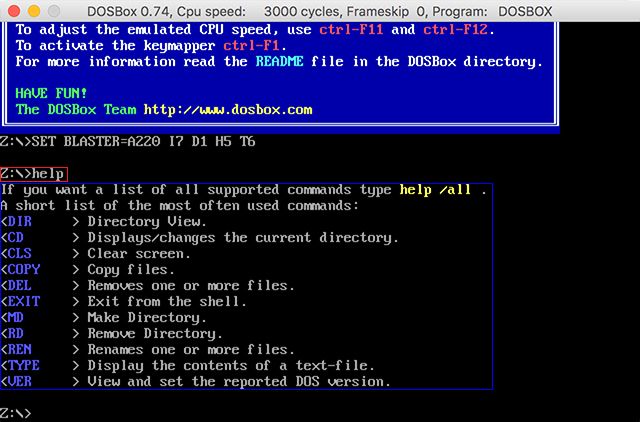 App for computers can be downloaded from DOSBox website in the Downloads section. Just choose the operating system on which you will play. During the download you will be redirected to sourceforge.com. Stay calm. It’s fine. Run it after successful installation and you will see this screen. Close it for now. 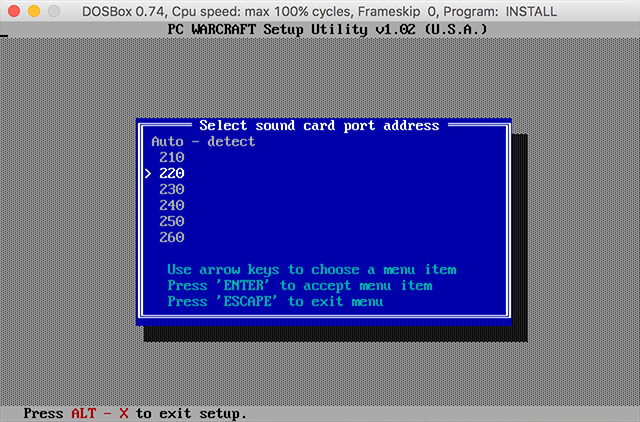 DOS works. But we have no game. For mac users. If macOS tells you that this is an application downloaded from the Internet and it is dangerous as your girlfriend father… well, you have no choice but to believe it. If macOS insists and doesn’t give you an Open button, try not to run it with double click. Instead of it do a right mouse button click (two fingers tap on a touchpad) and choose Open from context menu. — Sorry, man, check Amazon. They may have something lying around. Indeed there is still some sellers. But purchase a digital copy is possible only from pirates. We also need a game guide. It is a small book which was attached to the disc. It tells how to play and what to live for. How to play and what to live for we do understand, but we still need that guide. You’ll never guess why. If original guide was lost forever, it can also be downloaded from pirates. In addition to the game we need a patch to upgrade to the latest version of the game. This patch is just an archive file, that has to be extracted and executed. 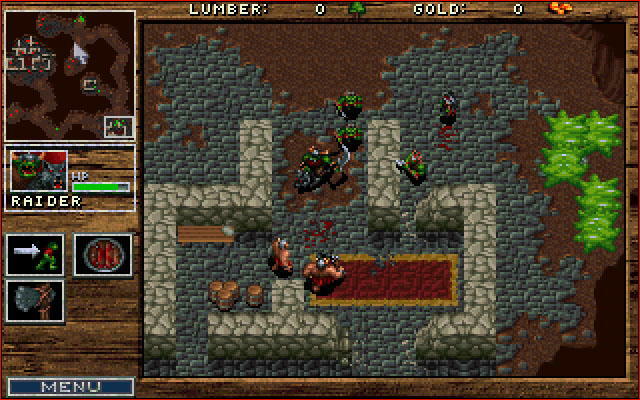 In the days of the original Warcraft games could not be updated by themselves. Most of people didn’t even have an access to the Internet. So this kind of patches were distributed by game magazines for example. For Blizzard games I found a Blizzard Archive. The latest patch is version 1.21 and on this website few of them are presented. I think it is from different distribution sources. I used one with the name Warcraft Patch 1.21(2). I recommend you to create a new folder not so far from the drive root and name it DOS. 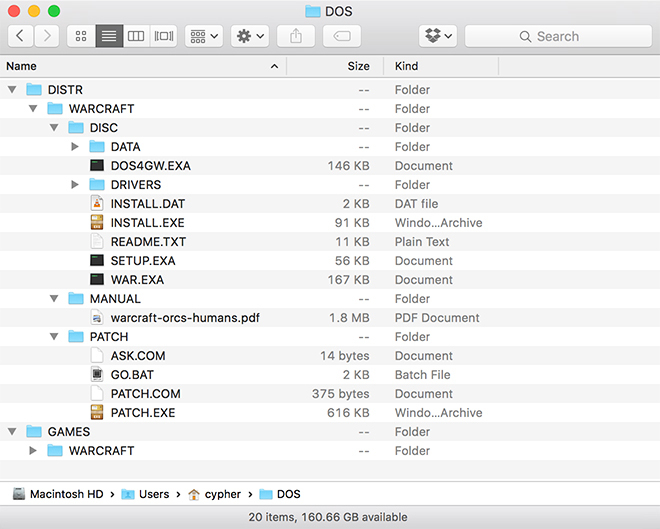 Create two subfolders: DISTR and GAMES and one more WARCRAFT folder inside of each one. First one is for game copy, patch and manual. Everything that we might need for installation. Again I recommend to create separate subfolders for each item. With second one we will deal later. We will install game there. Limit yourself by 8 characters for the folder or file name. Also avoid the characters other than latin letters and numbers. 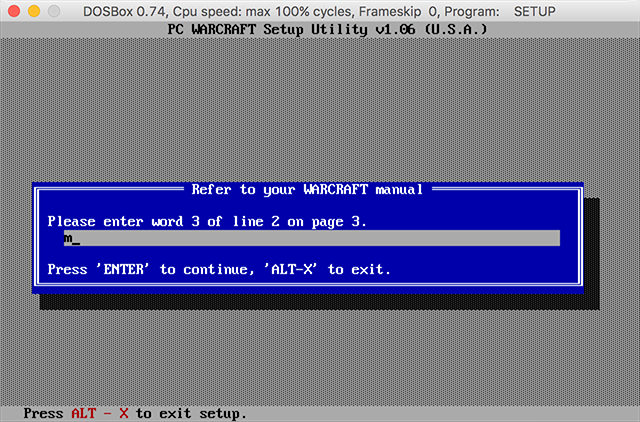 Don’t worry if the contents of your Warcraft copy is different from what you see on screenshots. It depends on which version of the game is in your hands: ROM or floppy disk. We will deal with it later. A hint for mac lovers. The ~ symbol in macOS means the path to your user folder. This is equivalent to the Users/terminator1999/. Here comes the most difficult part. Get ready. We have to type commands. 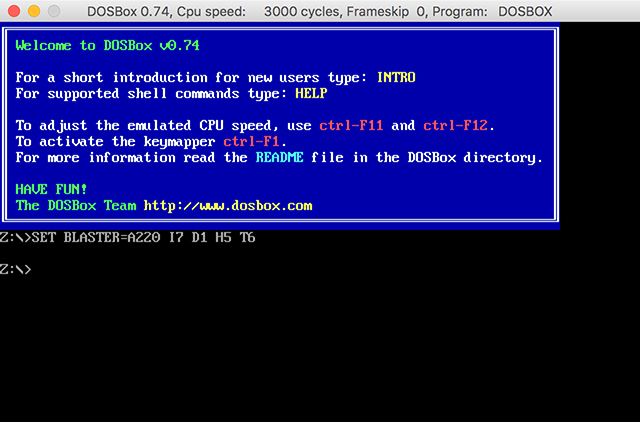 Run DOSBox to get into DOS. The first thing we see is Z:> command prompt and here you need to type some cheat codes to navigate through the folders to open or copy files and to run programs. But first we need to make some kind of connection between files and folder of our computer and things that DOS can see from inside of DOSBox. Let’s try simple help command. Type it and press Enter. That is how it works. That is how all of actions are performed in the console interface. To be honest I do not understand what’s going on inside, but I can assure you that we need a mount command. Let’s try to find help information about this command by typing mount help. These notes say that we can pick a folder from what we have on a computer and tell it to act as a local drive for DOS. To be a C: drive, for example. 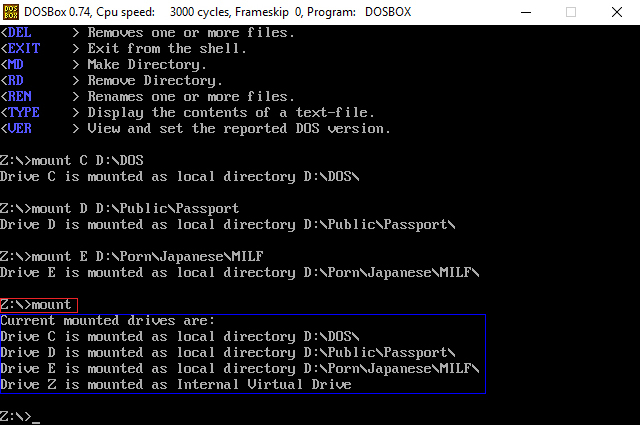 And the folder will actually act as a local drive for DOS. Exactly what is needed! Told ya! Let’s practice to mount folders into local drives. We did it! We have mounted three different folders into three DOS drives. It wasn’t a single drive a minute ago, and now there are three of them! And what a nice drives! Let’s try a mount command without params, just to double-check. DOS shows us what and where is mounted. Perfect. We can use commands like C: D: E: to switch between the drives. And Z:> Will be changed to C:> D:> E:> accordingly. In general this thing shows where we are on the computer. In other words it shows what folder is open right now. We can navigate around folders by cd command (short for Change Directory, I think). dir command is for look for contents of currently open folder. Let’s move to Warcarft folder and take a look! We reached a Warcraft! This picture shows us exactly the same thing that we saw a couple of screenshots above. DISC folder. But inside of DOS now. And here is INSTALL.EXE. It will start the installation. But let’s first unmount unwanted discs. Same mount command but with -u param. To go one folder up: cd .. You can think of these two dots as the name of the parent folder. Even more hints! You can press the TAB key when you type a file or folder name. It is kind of autocomplete. 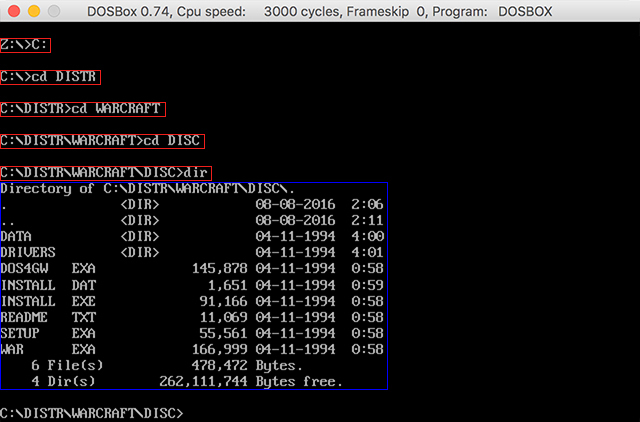 DOS knows what it has inside of the current folder and the rest of the name can be finished using first letters. 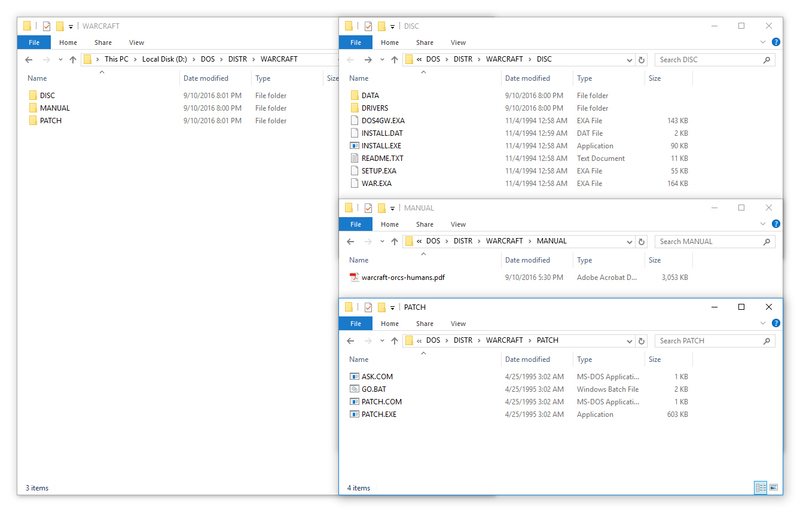 You can press several times, choosing files or folders with the same beginning of a name. And the ↑ key can type last used command. Can be pressed several times as well. 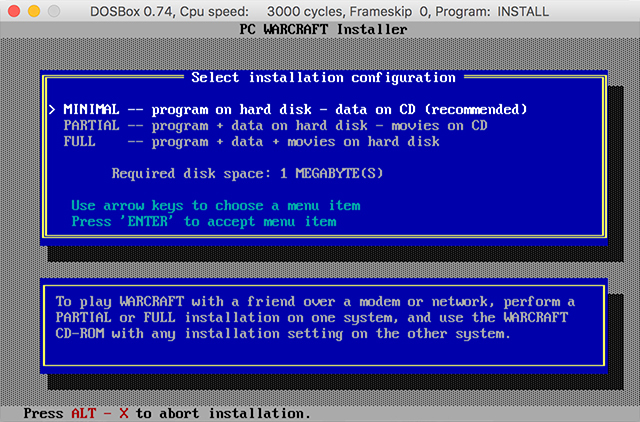 And we are coming back to the Warcraft folder and starting the installation. To execute a file in the DOS we need to type its name with the extension. This is the same thing to double click on the file in the modern OS. 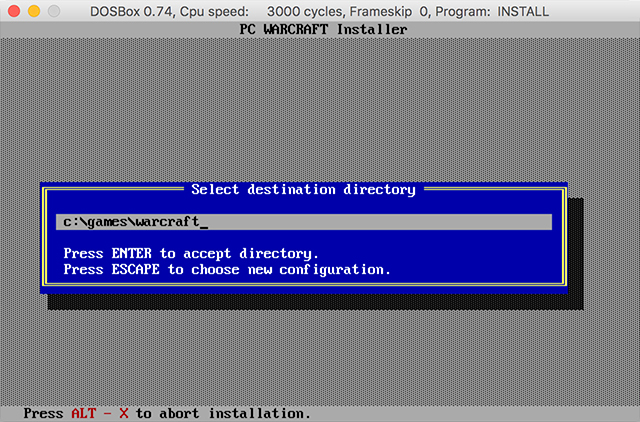 Installation wizard is welcoming us. Installer interface depends on the developer, not the operating system and for each game will be different. But the idea is always the same. Warcraft offers us three versions. Press ↑ / ↓ keys to pick one. Installation wizard will inform you how many space each version will take on the hard disk. In those ancient times when 74mb for one game was a waste of hard drive space, you could install only files that really needed to play. CG videos could be played from the game disk. Nowadays the problem seems funny. Just select FULL. 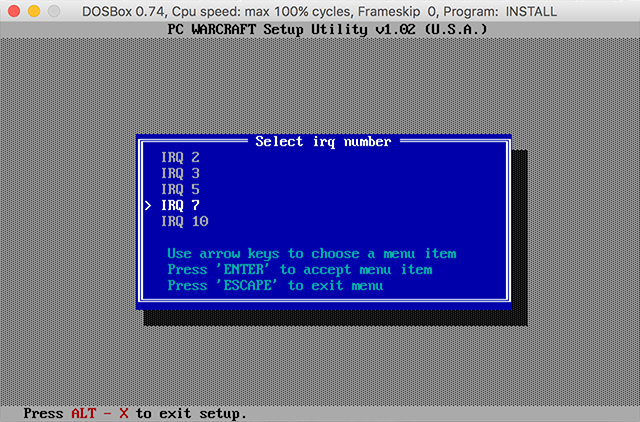 Here we see a setup utility screen. I have no idea about the old sound cards problems, but if we don’t go through this settings, the game will have no sound and music. 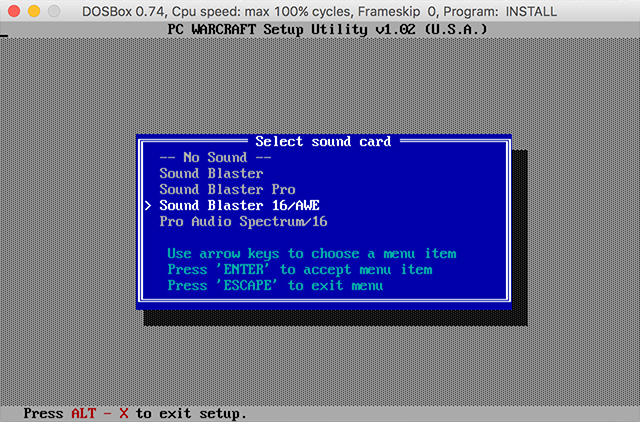 Well, select the first option Select digitized sound card and go through all steps of the guide. Fortunately this setup utility suggests us some values. Hit the Enter button a few times to choose the default settings. At the end we get back to the main menu of settings utility. 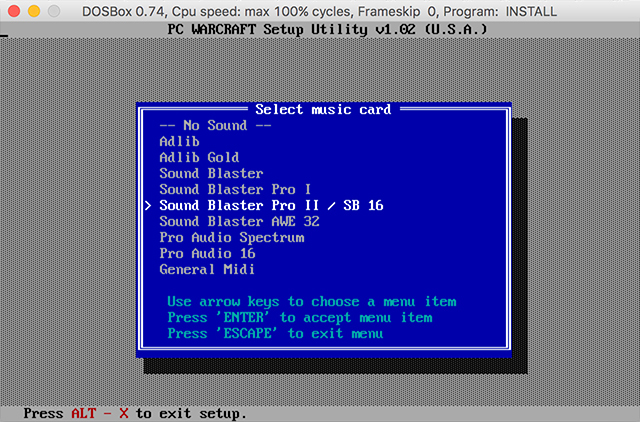 Select second Select music sound card option and configure it the same way. Quit this utility by choosing the Save settings and exit. But wait. It is still early to run the game, no matter what is written in console. 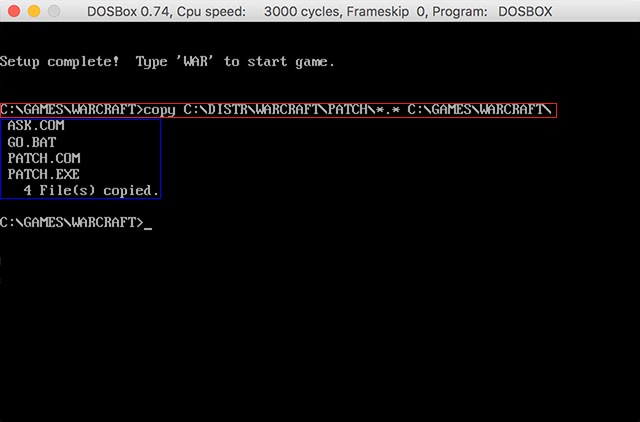 First we need to copy all patch files from DISTR directory to folder where we installed a game. Let’s try copy command. DOS will show which files has been copied when finished. 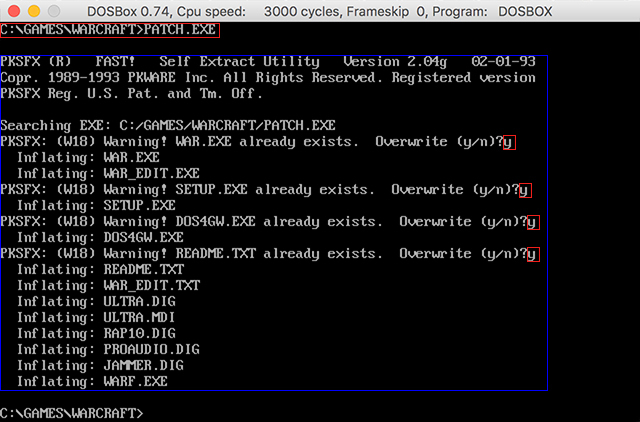 Now run the patch by typing its executable file name: PATCH.EXE. This thing will ask uncomfortable questions. Press y button to confirm. Do you know how to confirm that you are the rightful owner of the game, not an illegal copy? Right! If you really bought the game, then you should have a printed game manual. How to confirm that you have one? Correctly! Let’s enter a random word from the manual every time we start the game! If you think I am kidding you… well, no, it is not a joke. Check it on the internet. There was even more freaky ways to do it. It asks for a random word and tells you on what page and on what line and index of word he wants. Literally. Search for a right page by it’s number at the bottom. Line numbering includes headers. The installer gives you three attempts for each word. If you can’t do it from the first try, and you probably can’t, just try again. Sometimes it ask for words that doesn’t exist in manual. It is necessary to choose Save settings and exit option to quit. All done! Finally we can play. Type WAR.EXE file name or just WAR as shortcut to run the game. It seems that Warcraft stores save files as regular files directly inside the folder with the game. It refers to them as SAVE1.SAV and so on. 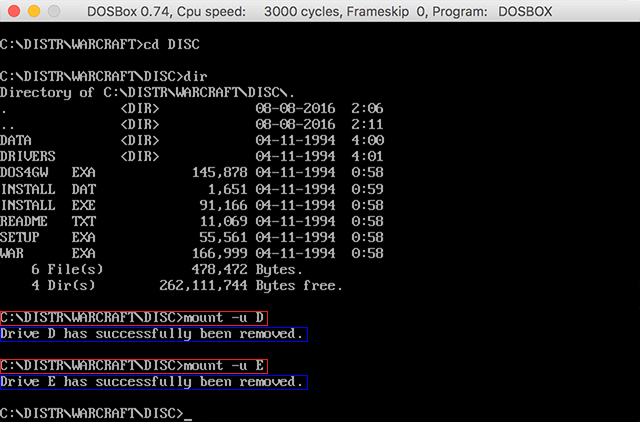 It tells us that if we save game inside of DOS we also save it under our main OS. Save files will be in place next time we run DOS. Moreover, we can even copy these files, and the installed game itself to another system, run DOS there and continue to play.